Touted as the citya��s first travel-themed cafe, The Lost Caravan or TLC is a fine blend of quirk and class. 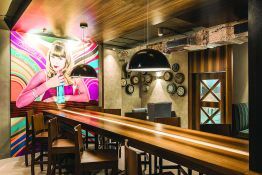 Modern and art deco interiors, with Andy Warhol-esque pop art, retro clocks and see-through suitcases packed with travel gear adorn the walls, while the tables are said to be crafted from reclaimed wood. 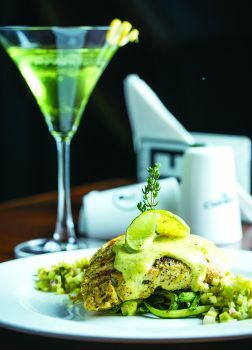 Set in the second floor above Starbucks on the chaotic Church Street, the resto bar serves as a haven amidst the madness. Choosing a quiet corner, we started with the cream of broccoli and cauliflower soup, which is perfect after a long work day. The neatly partitioned and subtly seasoned green from the broccoli and creamy white of the cauliflower were absolutely spot on with the accompanying crispy parmesan tuile. This was followed by TLCa��s version of crab cakes, which was also quite an impressive dish. Crab patties crumb fried with ginger and thyme, and served with a horseradish sauce, it proved to be a good option for a spot of comfort eating. One mustA� not miss the Varttiyathu curry with either chicken or beef, a complete assault on the senses. A recipe borrowed from neighbouring state, Keralaa��s cuisine, the meat is cooked with fragrant South IndianA� spices, diced coconut and aromatic curry leaves and is served over a banana leaf, further enhancing its flavours. For something perfectly midway between light and heavy, we recommend the open mini burgers, which come with a vegetarian, chicken or beef option. We opted for the beef version, which turned out to be a great choice. A pan-fried patty sits on a bed of bread, lettuce and pickled cucumber and is topped with a slice of fresh tomato, making it both refreshing and filling at the same time. Main course saw us digging into the fish fillet with mango salsa, which is pan seared bhetki on a layer of stir-fried zucchini, capsicum and sprouts. The filet is topped with finely diced raw mango, jalapenos, onions and cilantroa�� a dish of well balanced flavours. The spicy tangy pork too is quite a hit here, with the garlic marinated meat cooked with a selection of secret spices, fresh coriander and chilli. We ended our meal with Gypsy Churrosa��a decadently sinful treat.